The National Oceanographic Library holds a unique collection within its archives and special collections. We have a digital archive which is available to view. Our physical collection includes scientific data, photographs, monographs, slides, videos and other media. When you enter the details of the item that you want on the catalogue it will display a call number or code that tells you where the item is shelved. Although the codes look different, they work in much the same way: the combinations of letters and numbers gives a location based on the subject content of the item. The three letters at the end of each number are the first three letters of the author’s family name. Call numbers help us to group items on similar subjects together. The signs at the end of the shelves in the library explain where to find each call number. The library floor plan will show you where items with particular call numbers are stored. Use this form to suggest items to purchase for the National Oceanographic Library collections. The National Oceanographic Library holds print copies of all the Ocean and Earth Science, University of Southampton doctoral level theses in our archives; these are listed on Library Search and many of these are now also available online from ePrints Soton Please ask staff at the Help Desk if you need to see a printed copy of a thesis. The National Oceanographic Library includes resources on estuarine, coastal and shelf sea circulation, wind wave dynamics, sediment transport processes, global sea level science, geodetic oceanography, marine technology and operational oceanography. 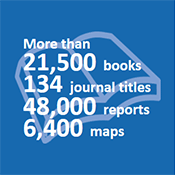 The National Oceanographic Library uses an in-house classification scheme for most of the collections with the exception of the Reference Collection and a small section of non-academic books which are arranged on shelves using the Library of Congress classification scheme. Floor plan showing all 3 levels of the library. Explains all the steps of the process, from checking the Library catalogue to find the subject code to finding the book on the shelf. How to find a printed journal when you know the name of the journal. Locating the reports collection and items in the Loose Papers collection. Books are on the main level of the National Oceanographic Library (level 4). Most of the printed journals are on either level 4 (journal titles from A to N) or the lower floor [level 2] (journal titles from N to Z). A small number of journals are held in the NOL archives. If you need assistance finding materials please speak to library staff at the Help Desk who will be pleased to help you. Course Collection - The National Oceanographic Library [NOL] Course Collection is located next to the self-service machine. The collection is open access. Items can be issued for loan at the Help Desk whilst it is staffed during our loans service hours. Alternatively items can be borrowed using the self-service loans unit. Copies of recommended textbooks. Books are arranged in call number (shelf mark) order. When the Library is open you can return items to the Help Desk or use the self-service loans unit. When the Library is closed, a box for returns is available outside the entrance. Course Collection items must be returned to the library from which they were borrowed. Items borrowed during the day are due for return by 11:00 the following day.This applies every day except Friday and Saturday when items are due for return by 11:00 on Monday. We always welcome your comments, queries or feedback regarding either the course collection in particular, or material required for undergraduate course work in general.